Ever since I found out I was expecting Baby Baker - after over three long years of trying - I seem to have been totally overwhelmed on more than one occasion. It's such a huge, fantastic thing to happen - especially when you've waited for it for so long. 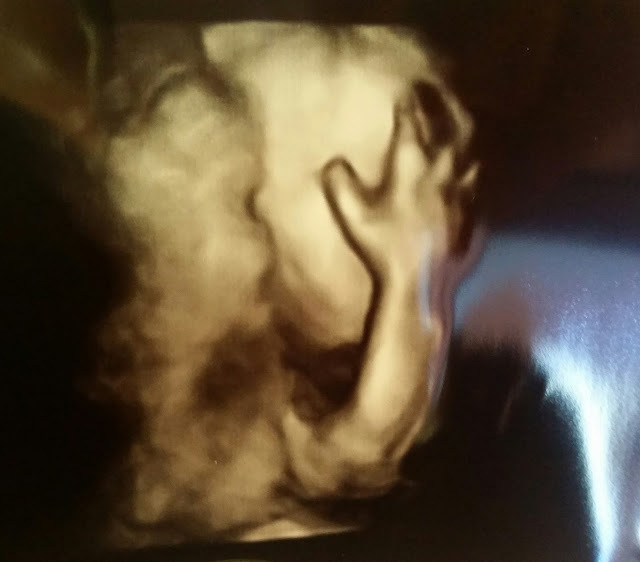 One such "overwhelming occasion" came when I went to my twenty week scan and I was told we were expecting a little girl. There is no way on earth that I expected to be having a girl - no way, no how, not ever. And then I attended an Expectant Parents Event at Mothercare and was introduced to Babybond where I discovered that apart of what they do is offer 3D and 4D scans to mums-to-be. As well as actually getting to see the little bundle growing inside my stomach I would be able to get pritty much a definite boy or girl decision. A second opinion, but in 3D? And I mean, who knows, this may be the last baby that we have - I want to make sure I do everything and try as much as I can whilst I can. These options weren't around when I had my son a massive ten years ago, and if they were I certainly didn't know about them, so I really wanted to make sure I got myself booked in to have the experience this time around - just to be able to see the results at least once - and that's exactly what I did. On the day of my appointment I headed inside to the back of the huge Mothercare store at Crown Point, Leeds where I was met by a really friendly member of staff who showed us to a small, comfortable waiting room where I signed the necessary paperwork and excitedly waited for my turn. The scanning room itself was again very clean, comfortable and set out pritty much as I expected - a bed, scanning machinery, a wall mounted monitor and seats for partners and family members to watch too. The lady carrying out the scan was really chatty and friendly and made me feel at ease straight away. The initial images showed up the same as I remember from my hospital scans - everything in 2D and black and white - which allowed estimations to be made about baby's growth and important checks to be made on the heart, diaphragm, bones and other organs. Now, obviously, she - yep we got that all important confirmation of a little lady - decided to be a cheeky madam and wouldn't play ball at all. I even went for a walk around the store and ate some sugary food before heading back in to be scanned again, but nope, Baby Baker knows what she likes and obviously isn't going to do anything she doesn't want to do. And today, she was not moving. We were taken pity on and were very kindly invited back for a re-scan, to try our luck, but on a different day. Babybond offer this re-scan as part of some of their packages and I think it's a great idea, especially as a few of the options available are quite expensive. If baby isn't doing what is needed to get a good look during the first attempt then at least there is that option to try again another day. We re-booked and then headed back to the store a week later. ...needless to say no one actually knew what to say or do except laugh. I mean, can you believe it! It seemed that this time, Baby Baker was playing a little bit nicer for us. I actually can't believe how clear the pictures are, it's totally amazing and definitely an experience I'm so, so pleased that I had. The package I had was option one from the 4D Bonding Scan range and it really was just that - a total bonding experience. Being able to see little yawns and stretches and funny, quirky images like the one above gives everything a real "ah, so this is actually happening then" realisation. 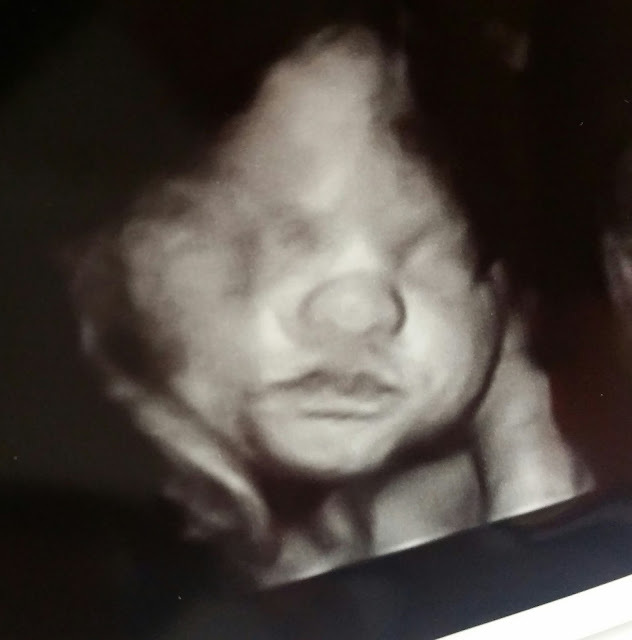 For me, the whole scan experience made Baby Baker seem more real, almost as though she already has this funny, cheeky little personality developing - it really is very beautiful and something I would highly recommend to anyone. 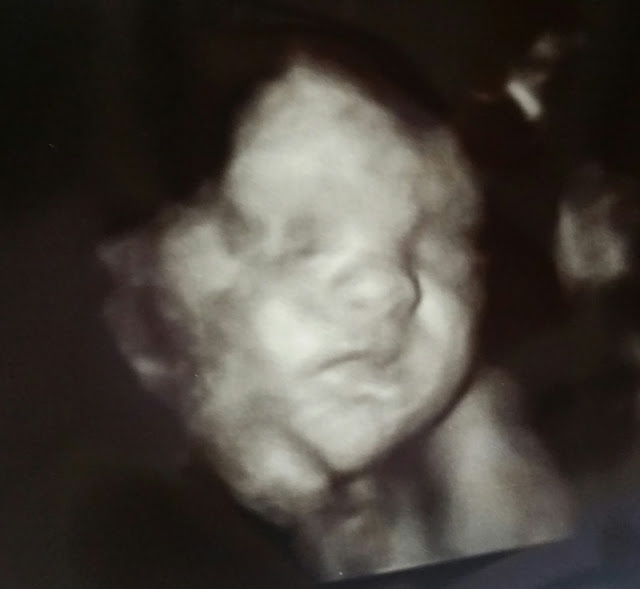 Also by being able to include my son in the experience we've had lots of conversations since the scan regarding how naughty he thinks his little sister is going to be once she is born. He loves nothing more than giggling over the antics he thinks they'll get up to and the pranks they can play on us. He's even taken the lead when it comes to telling other family members about what he saw and this is something priceless to us - to have him happy, excited and openly accept the fact that, after 10 years as an only child, there is a new member of our family arriving. And thanks to Babybond we certainly have a few more fabulous stories to help us along this track. Pregnant? - I highly recommend you give Babybond a go! After spending the day in a massive soft play area with my Best Friends little girl, this has actually bought a few tears to my eyes. How beautiful. What a fab way to see your little one. Exciting times ahead. Exciting times for you now too.